St. Adelaide was a marvel of grace and beauty, according to St. Odilon of Cluny, who was her spiritual director and biographer. Daughter of Rudolph II, King of Burgundy, she was born in 931 and at age 15 married Lothaire II, King of Italy. Later their daughter became Queen of France. Adelaide was 18-years-old when she lost her husband, who was supposedly poisoned by his political competitor Berengarius of Ivrea. The latter soon proclaimed himself King of Italy and proposed to unite Adelaide in marriage with his son. The widow refused and Berengarius confiscated her estates and held her prisoner in the Castle of Garda. St. Adelaide managed to escape and fled to the Castle of Canossa, property of the Church. From that impregnable fortress she directed a plea to Otto I, King of Germany, to come to her aid. Otto I hastened to her appeal with a powerful army. After defeating her oppressor, Otto became King of Italy and married St. Adelaide. One year later, in 952 he was crowned Holy Roman Emperor in Rome. The eldest son of this marriage, Otto II, succeeded his father as Emperor. At first, influenced by his jealous wife Theohano, Otto II revolted against his mother. Fearing for her life, she fled to Burgundy. There she came to know St. Odilon and became famous for her charities to many French monasteries. After Theophano died, Adelaide became the regent of her grandson, Otto III. She used her position to help the poor, evangelize, and build and restore monasteries and churches. When she felt her end was near, she asked to be taken to the Convent of Seltz in Alsace that she had built. She was laid to rest next to the tomb of Otto the Great, her second husband. The life of St. Adelaide is so extraordinary that it could be the subject for a medieval illumination. She was not the kind of saint who lives in a convent in the recollected life of a cloister. Rather, she is the heroine who has great adventures and passes through the most difficult dangers. She was not the kind of person whose ideal is to live in retirement. To the contrary, she saw in the risk, in the uncertainty, in the fight for the cause of her legitimate rights, the reason for her life. For her this was the salt of life that gave it flavor. She was a Princess, daughter of the King of Burgundy, and married the King of Italy. Berengarius II supposedly poisoned her husband, proclaimed himself King of Italy and wanted her to marry his son, that is, the son of the murderer of her husband. If she had, she could have lived an easy life, without problems. She refused, was imprisoned and exposed to the worst offenses. She escaped. I admire her escape very much. Normally one has a different picture of a holy woman in prison: a sad lady, a little overweight, seated next to a column, weeping, lacking the cunning to fool the guards. She was the opposite. We can imagine her vigilant, studying her chances to escape. And when the moment came, she had the agility of mind to act, to slip through a door, to jump over a fence, to seek provisory refuge and then continue the flight until she was out of danger. A saint is not like the caricature of the sad fat lady; a saint has to have the virtue of fortitude. St. Adelaide also knew where to find safety. She went to Canossa, the impregnable fortress where St. Gregory VII stayed when he received Emperor Henry IV, who went there to make penance, kiss the feet of the Pope, and ask forgiveness. Canossa was a territory that belonged to another king – the Pope, who was also a temporal sovereign. Therefore, Adelaide knew where to seek refuge: she was a good politician. She had the innocence of the dove, but also the cunning of the serpent. After that, what did she do? Something one would not expect from a saint. She arranged a marriage for herself, and a very good one. She wrote to the King of Germany, the heir of the Holy Roman Empire, and asked him to come to defend her. He did, and then they were married. For her this represented the beginning of a new life. You can imagine the great fortitude of this soul, her dedication and courage. 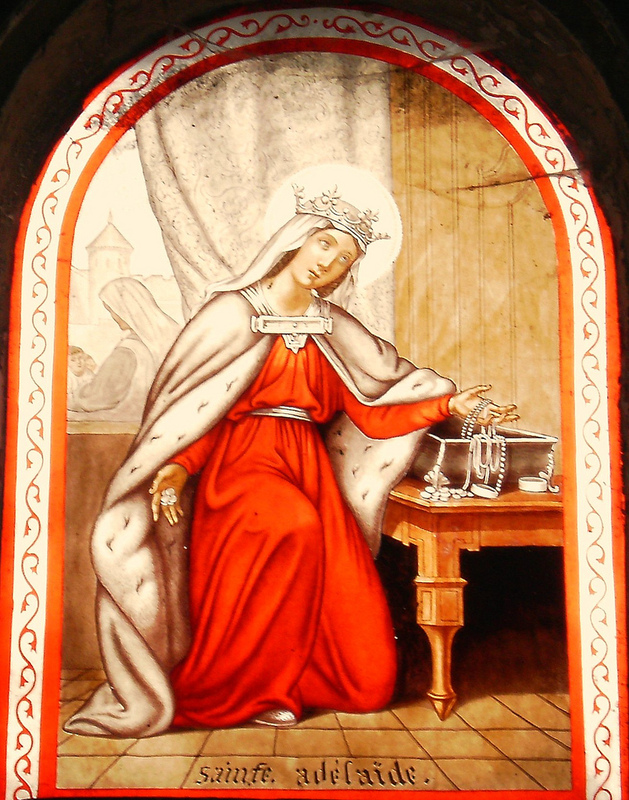 The magnificent virtues of St. Adelaide are the very opposite of the caricatures often painted of the saints! There is a grandeur in this title that comes from the simplicity of the contrast of the two descriptions. She attained the highest position a woman can have on earth, but she recognized that everything was due to grace.